On the outside 111 Riverfront is a beautifully restored historic building in Winona, MN. The inside is filled with stunning business offices. The office building is placed at a perfect location with restaurants and shops right around the corner. This is a great option for businesses interested in a new space. 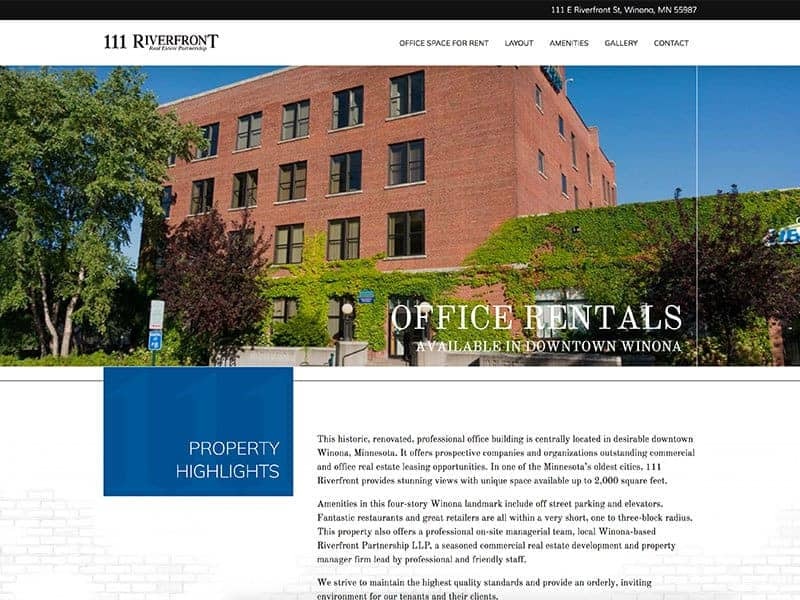 Looking to rent out the open spaces and promote upcoming neighborhood projects, 111 Riverfront asked our team to help them build their website. Creating their website included incorporating all their amenities and information into an attractive sales tool. To help 111 Riverside generate new leads, SEO optimization and other strategies were implemented as well. Let us help create the perfect website for you! Click here to learn more.